A species of ferret-badger (pictured above) hitherto not known to western science has been found in a national park in the central Vietnamese province of Ninh Binh. It was announced in the German scientific journal Der Zoologische Garten. Tuoi Tre newspaper on November 23, 2011, noted the non-profit organization PanNature as saying that the animal, Melogale cucphuongensis sp.nov, belongs to the genus Melogale, which has four species – together known as weasels — and is mainly found in Indochina, Java, Bali, and parts of Borneo. It has different characteristics from the other four — a dark brown head and body with a black and white stripe running from neck to shoulders. Newswire Dan Tri said the new species, locally known as chon bac ma (silver-cheeked fox) had first been discovered by the Cuc Phuong National Park’s Endangered Primate Rescue Center in January 2006 when it attempted to rescue an injured ferret-badger. However, its study was interrupted because the animal died, and only recently could another animal of the same species be found. 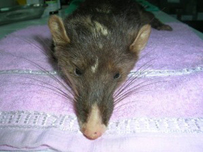 One of the related ferret-badgers, the Burmese, is pictured below. Credit: Mariomassone. Permission: GNU Free Documentation License. A related new species of mammal, the ferret-badger shown below was discovered in Royal Manas National Park, Bhutan, for the first time in February 2010. The ferret-badger is small dark grey carnivore with pale or white lips, chin, throat, belly, and inner legs. It has a dorsal white streak from head to shoulders and has long, white tipped, brownish-grey tail and padded feet with striations suitably adapted for tree life.